Scientific experimentation has shown conclusively the value of setting goals. If you have to prepare and mail a thousand letters, and if someone else who works exactly like you has to do the same, you can get your letters done faster by having your thousand in stacks of ten and the other guy’s letters in one stack of a thousand. If he has the stacks of ten and you the one stack of a thousand, he will do his faster. Scientists have proven this phenomenon many times with corn shucking and wheat harvesting and stamp licking and many, many other activities. People work more efficiently when they have goals to work toward, even if they don’t know they are racing. Somehow, the idea of just getting ten done and then starting over is more appealing to the human psyche than the prospect of doing a thousand. By doing ten, there is a feeling of accomplishment (however small) that inspires (however slightly) a person to work better as he starts the next ten. This proven fact cannot be overlooked in regard to your practicing basketball, playing pickup games in the summer or walking out to a court to play the big game of your season. Having specific goals will help you attain your ultimate objective—to play good, winning basketball—more easily. When you walk onto a court to practice alone, you shouldn’t just “shoot around.” You should count your shots and have definite objectives. “I will shoot free throws today until I hit 45 out of 50.” Walk out there knowing what you are going to work on, and do it. If you are playing in a pickup game, don’t always play your “same old way.” If the competition is easy, make yourself do everything left-handed. (And don’t tell anyone, if you happen to get beaten, that you were only using your left hand. Learn not to save face but to get better.) 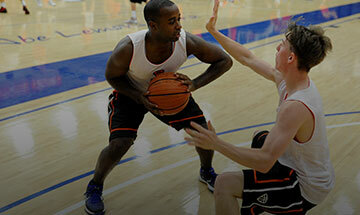 If there is an excellent player in the game, try to guard him and keep him from touching the ball. Or go into a game concentrating on an area you aren’t good at. For example, play the whole game concentrating on getting offensive rebounds. Count how many you get. Or count how many steals you get or how many balls you are able to touch on defense. Too many players go to the courts and play and never get any better at their weaknesses. Pickup games are the time to experiment. Once you get into your regular season, you can’t afford to experiment. You have to polish the skills you have and show that you know how to play within your own limitations. In pickup games, you try new moves, not during your season. So go into pickup games prepared to try new things and knowing which things you are going to try. During your regular season games, you still need goals. Go into games wanting to cut down on the number of turnovers you had last game, get your hands on more balls, call on yourself to set better screens or shoot a better percentage. You should have no problem finding things to concentrate on. What does your coach criticize you for every day in practice? Are you in the habit of writing down your objectives before each game and then after the game writing down what happened, how you came out? Why not? Do you think it isn’t necessary? Players who really are trying to improve will do these things, and they will improve faster than you. This is why coaches are in the habit of saying, “We take ’em one game at a time.” The best way to have a good season is to have a good game now. The best players know to strive do a little better tomorrow than they did today. Don’t walk out onto the court, whether for practice or a game or a summer pickup or when shooting alone, without having definite objectives in your mind. The best way for you to be a lot better player a year from now is for you to do a little better tomorrow than you did today.